Dr. Robert Mesibov contributed this post. He’s a taxonomist from down under who studies seriously fungophilic animals: millipedes. If you studied the traditional sort of biology, you’re probably carrying around an unfortunate prejudice. You see terrestrial habitats as a simplified nutrients-and-energy pyramid. At the bottom are green plants, feeding on sunlight, carbon dioxide and soil water and minerals. Next layer up on the pyramid is the herbivore mob: leaf and stem eaters, sapsuckers, root nibblers, seed and fruit gobblers. Above these green feeders are a couple of layers of predators. And that about sums up the world, right? The truth is that in the real world outside the biology classroom, only a tiny proportion of terrestrial primary production goes through the stomachs of the few evolutionary lineages brave enough to tackle what green plants produce. In any terrestrial habitat, the great bulk of primary production just does *not* get eaten. It sits, instead, at the bottom of a very different food pyramid. I call it the Dead Plants Society (DPS), as opposed to the Green Feeders Guild (GFG). In the absence of fire, all that uneaten primary production is first attacked by fungi and bacteria. By ‘attacked’ I mean ‘converted from low-nutrient indigestibles to concentrated yummies’, i.e. fungal and bacterial bodies. Stacked on top of this microbial layer in the pyramid are microbivorous layers of nematodes, mites, springtails, earthworms, millipedes and other soil animals. On top of those are predators – but picture ‘centipede’, not ‘eagle’. The GFG and DPS animal communities differ in many ways. To begin with, in any given habitat the GFG has very high species diversity (think of plant-eating insects) but low higher-taxon diversity, while the DPS has great higher-taxon diversity (lots of strange sorts of animals), but low species diversity. Next, GFG herbivores tend to specialise on particular plants, while DPS microbivores will eat anything that’s rotting nicely. There are also a lot of winged GFG members (‘gotta find that particular plant I like…’), whereas almost no DPS members have wings, at least in their younger, feeding stages. There’s an architectural difference, too. The GFG extends well up in the air, to ca. 100 m in some tall forests, while the DPS is largely confined to the ground. Image of the millipede Narceus americanus by Kent Loeffler, copyright Cornell University. You can find this borescopic image among the many in our book. Check out Bob Mesibov’s other many-legged doings via his website. Thanks for putting in a good word for the bottom feeders in our backyards. I’m often making a pest of myself begging folks not to poison their lawns with ChemLawn crap, so I’m glad to have some back-up about this. It’s hard to get folks to care about critters they can’t see. Love that millipede photo! Hi Jackie! Hope you keep pestering your neighbors. Even those who dislike little crawlies should think hard before using pesticides on their lawns. Aside from their impact on wee beasties, pesticides pose a grave cancer hazard. Ontario and Quebec recently banned the cosmetic use of most pesticides (yay! )—time for the US to catch up, eh? What is this in the picture? the pattern on that curling worm is gorgeous, but knowing that it’s a worm, I can’t help but feel like queasy. I wish I hadn’t realized it was a worm. Don’t worry, it’s not a worm–it’s a millipede! 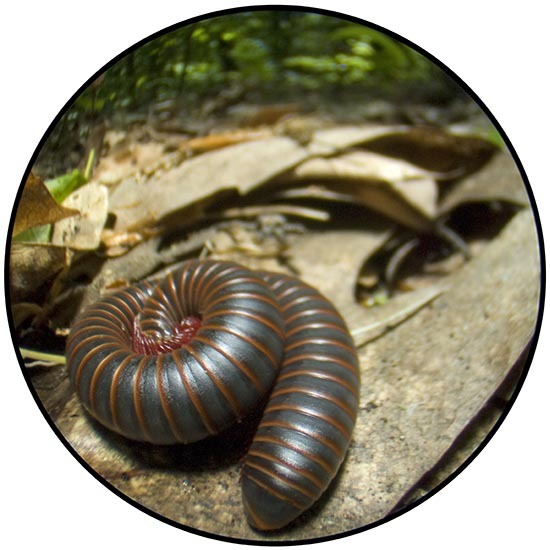 I know phobias can be pretty entrenched, but consider this: millipedes don’t bite, they’re slow, and they eat leaf litter and other rotting stuff. This particular milipede is about 4 inches long–it’s the biggest millipede we have here in the northeast. I love them. This piece was kindly reprinted on one of my favorite blogs, Small Things Considered. Check it out!